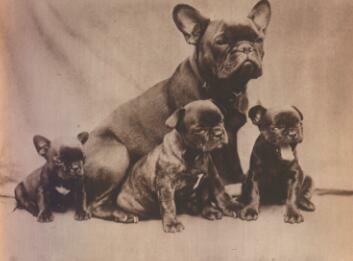 French Bulldogs have been bred for progressively flatter faces since the 1890s. We’ve always known that one of the goals of breeding dogs is to alter their personality types, to give us the right dog for the right job. Bird dogs who are ‘birdy’, Border Collies who are ‘herdy’, police dogs who are scent oriented. We’ve known we can breed for certain characteristics, such as high drive prey drives or the desire to go to ground after rodents. In Frenchies, we’ve bred our dogs to perform the ‘job’ of companionship – placid temperament, lower energy levels, a certain need and desire for human companionship, as opposed to the aloof temperament of dogs bred to work alone. We’ve assumed that we’ve accomplished this through intentional selection, but what we haven’t realized is that breeding for flatter faces has actually been altering the actual structural shape of our dogs’ brains. The brains of many short-snouted dog breeds have rotated forward as much as 15 degrees, while the brain region controlling smell has fundamentally relocated, researchers from the University of New South Wales and University of Sydney have found. The large variations in dog skull size and shape follow more than 12,000 years of breeding for functional and aesthetic traits. The discovery of such dramatic reorganisation of the canine brain raises important questions about impacts on dog behavior. The research is published this month in the Public Library of Sciences journal PLoS ONE. Scientists aren’t yet sure what overall differences in canine personality type and brain function these structural changes may have caused, although they speculate that, at the least, this had led to radical differences in the ability of flatter faced dogs to be able to determine scent. “The next obvious step is to try to find out if these changes in brain organisation are also linked to systematic differences in dogs’ brain function,” Dr Valenzuela said. It is interesting to ponder whether the change in brain structure can be linked to any definitive changes in behaviour or personality. One thing is for sure, this makes the occasional tracking titled French Bulldog even more of an accomplishment of merit!